The economics of 2018 corn production challenge many farmers with minimizing losses per acre. One area some farmers have targeted for reducing costs is hybrid selection. Planting corn hybrids without Bacillus thuringiensis (Bt) proteins for protection against European corn borer (ECB), corn rootworm or both will greatly reduce seed costs. However, if not careful, farmers could inadvertently reduce crop revenues if they select hybrids without considering yield potential or insect populations in their fields. Yield potential is the first thing to consider when selecting a corn hybrid. Bt traits only protect the yield potential of a hybrid; yield benefits only occur when targeted insects are above economic levels. When insect pressure is low or absent, economic benefit with trait-protected hybrids only occurs if higher costs are offset by greater yields. Switching to less-expensive non-Bt seed can be a good strategy when yields are comparable or when seed cost savings exceed any reduced yield potential plus prospective insect losses. In many 2018 fields, planting corn without a Bt trait can work, if you recognize your insect risk. Since the adoption of Bt corn 22 years ago, Bt use rates in Minnesota have grown to approximately 80% of the total acres planted, including the 2017 season (Figure 1). 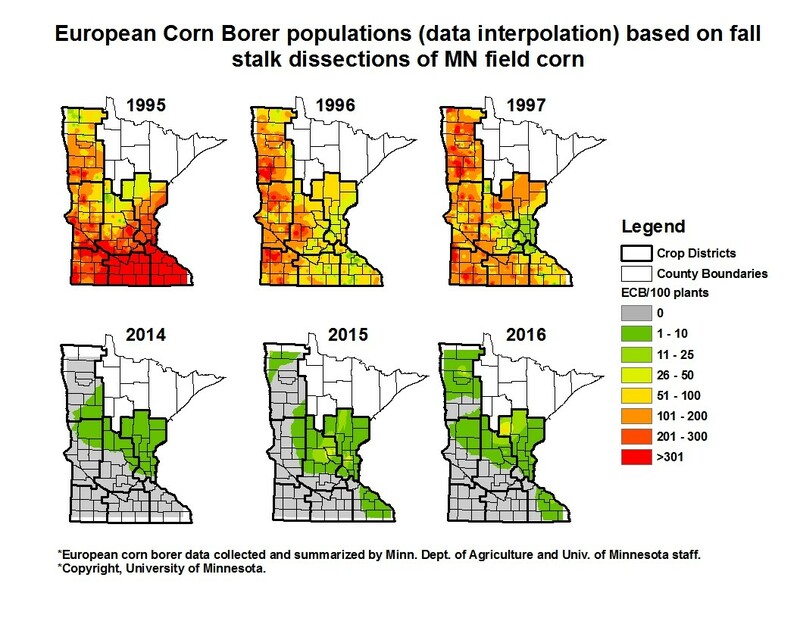 ECB populations throughout most of the Midwest Corn Belt have been effectively suppressed by a similar adoption of Bt. ECB populations continue to be low in Minnesota where Bt use has remained relatively high since 2007. Low ECB moth flights (Figure 2) parallel the low ECB larval populations detected in the fall surveys (Figure 3-4). Figure 1. Adoption of Bt corn hybrids in Minnesota. Conventionally bred herbicide resistant varieties are excluded. Insect resistant varieties (solid line) include only those containing Bacillus thuringiensis (Bt). The Bt varieties include those that contain more than one gene that can resist different types of insects (e.g., European corn borer; corn rootworms since 2003). 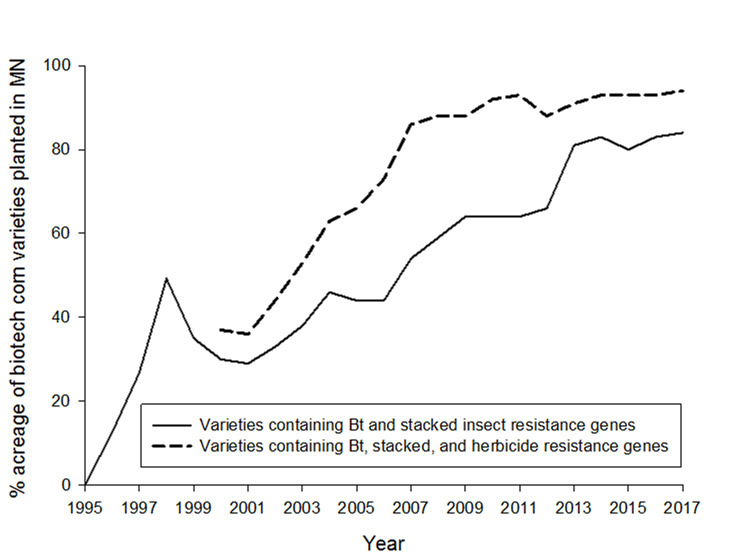 Stacked gene varieties (dashed line) include only those containing biotech traits for both herbicide and insect resistance. Figure 2. 2017 MN black-light trap ECB captures. 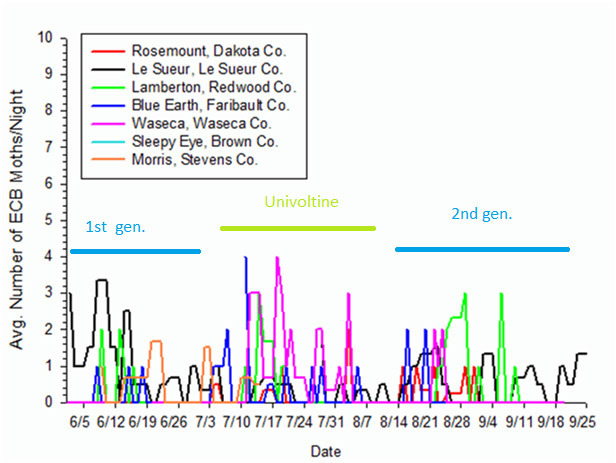 Most locations show three, albeit very small, peaks representing 1st-generation multivoltine flights, univoltine flights and the 2nd-generation flights. The early June peak corresponds to 1st-generation and the mid-August to September flight corresponds to the 2nd-generation. 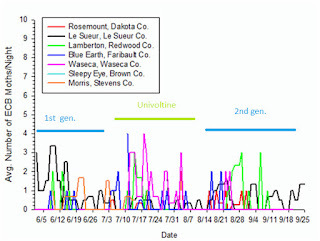 The 2nd-generation ECB flight can overlap the univoltine moth flights that occur in July to August. Source: MN Extension IPM Program: https://www.vegedge.umn.edu/moth-data/ecb-info. Figure 3. Historical overwintering fall ECB populations (1995-1997) comparing a pre-Bt era infestation peak (1995), with the early years of commercialization (1996-1997) and recent years. Source: MN Extension IPM Program (E.C. Burkness, W.D. Hutchison, & B.D. Potter). Figure 4. 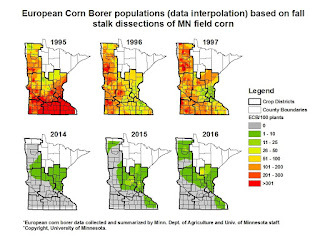 Overwintering European corn borer populations (data interpolation) based on fall stalk dissections of 2017 MN field corn in known non-Bt and randomly selected fields. MN Extension IPM Program (E.C. Burkness, W.D. Hutchison, & B.D. Potter; https:www.mnipm.umn.edu). Figure 5. Overwintering European corn borer larva and its feeding damage within the lower stalk. 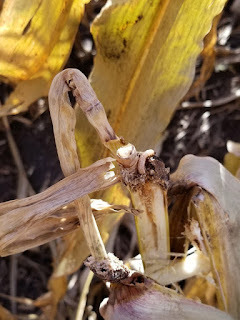 While stalk breakage or ear drop are readily visible, the extent of tunneling and physiological yield loss can be seen only after the stalk is split. Photo: Bruce Potter, University of Minnesota. Figure 6. Fields sampled in 2017 where Bt protection from corn borer was known to be absent. White - no damage, Yellow – tunnels, Red – tunnels and larvae both found (E.C. Burkness, W.D. Hutchison, & B.D. Potter). In 2017, the MN Corn Research and Promotion Council provided funding to increase the number of fields surveyed for ECB damage and overwintering larvae (Figure 5) last fall. As part of the project, several farmer cooperators volunteered non-Bt fields for the survey. Importantly, this cooperation allowed us to sample 52 fields that we knew in advance did not have above-ground Bt traits (Figure 6). These fields greatly contributed to our understanding of the current spatial pattern of ECB in the state and revealed where ECB might gain a foothold in non-Bt fields. A total of 201 fields, across all major corn producing counties, were sampled for ECB. Numerically, across the 149 randomly selected and sampled fields, the state average overwintering larval number per plant was 0.0054/plant in 2017; this compares to the random sample of 0.016/plant in 2016. In contrast, the average ECB population density in known non-Bt fields was at 0.029/plant, with the grand total of all 201 fields averaging 0.0114/plant. While higher than the density in fields at random, the average density in non-Bt fields is much lower than the traditional economic thresholds or injury levels for ECB. It is important to remember that these numbers are state averages and the maps represent interpolated spatial data and do not reflect the densities within an individual field. For example, the shaded area in SW MN was generated by a single ECB infested non-Bt field (Figure 6). In other words, they do not replace scouting for field-specific decisions. From an area-wide and long-term resistance management view, it is prudent to maintain some ECB in the state as part of the “non-Bt corn refuge for ECB”. Any moths that emerge from non-Bt fields should theoretically have experienced less Bt selection pressure and are therefore pass on more susceptible genes as they mate with any rare Bt resistant moths that might survive from nearby Bt fields. Going into 2018, ECB populations remain generally low. However, scattered reports of damage to non-Bt corn demonstrate ECBs are still present and pose a prospective threat in Minnesota. That said, a temporary increase in acres planted to non-Bt corn should not dramatically increase the risk of economic damage from ECB in the near-term. However, this risk likely increases as the proportion of local fields planted to non-Bt increases, particularly where the local shift away from Bt has occurred for several years and non-Bt corn is planted in large contiguous blocks. 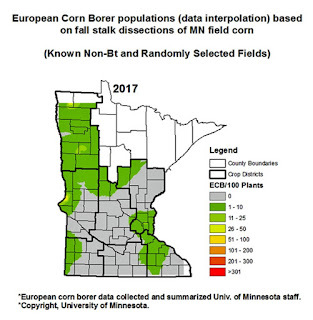 Most likely reflecting the higher percentage of non-Bt or conventional corn planted over the past few years, fall ECB populations were most often found in parts of SE, EC, C, WC and NW Minnesota (Figure 4). As growers choose to plant less Bt corn, these populations should be expected to increase. 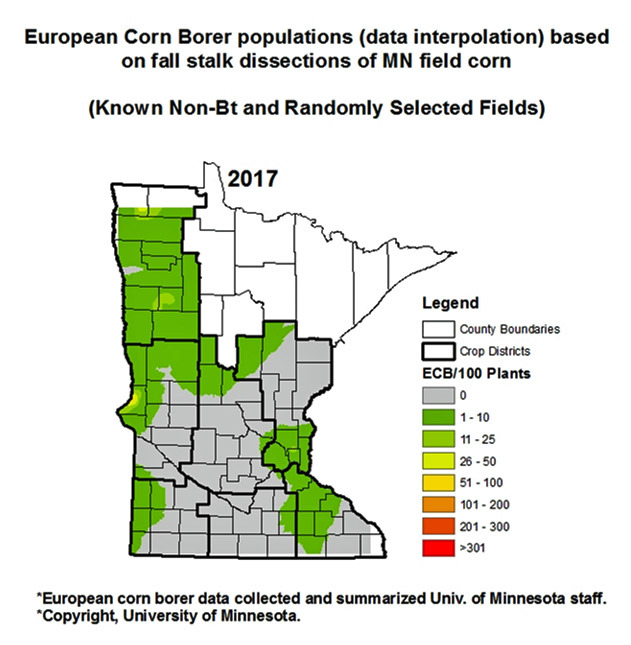 Two biotypes of ECB borer were introduced into Minnesota. A univoltine biotype that produces a single generation of eggs and larvae each year was the first type introduced into the U.S and historically predominates in the northern corn growing areas of the state. Multivoltine biotype moths emerge earlier in the growing year. In southern MN, they are capable of producing two, rarely three, larval generations depending on temperature accumulation and photoperiod cues. Both strains overwinter as 4th or 5th instar larvae, pupate in the spring and moths begin emerging in mid-May or later. Risk of yield loss from ECB can be reduced if you scout fields and apply a labeled insecticide where needed. Early and late-planted fields will be most attractive to egg-laying 1st and 2nd generation moths of the multivoltine biotype, respectively. These fields should be scouted for ECB if planted to a hybrid without an above-ground Bt trait. In contrast, it takes the univoltine larvae longer to complete development with an adult flight in-between the multivoltine 1st and 2nd generation moths. Where the univoltine biotype strain of ECB occurs, scouting should focus on fields from pre-tassel to near pollination when the flight is underway, typically mid-July to early August. In areas with biotype mixtures, mixed infestations can occur with overlapping and prolonged scouting windows. 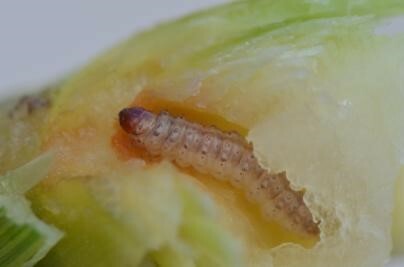 Larvae are susceptible to insecticides for 10-14 days during each generation, from hatching to tunneling of third or fourth-stage. This limited window means your scouting efforts must be timed well. As corn grows, successive generations appear lower in the corn canopy; insecticide effectiveness declines with greater canopy interception by leaves above the larvae. Percentage control for well-timed applications declines from 85% (1st generation) to 70% (univoltine) to 50% (2nd generation). Expect control with insecticides, even if timed well, to be noticeably less effective than Bt traits (>99.5%). Larvae have tunneled into the stalk, ear shank or ear are not susceptible to insecticide sprays and should not be considered in your spray decision. Re-evaluate the field closer to application if there is a scheduling or weather-related delay in getting the field sprayed. With aerial applications, water volume is critical: the more the better and 5 gpa is preferred. Performance is enhanced by presence of a heavy dew (favors movement into whorl or leaf axils) and diminished when using lower water volume, when leaves are dry (no movement to leaf axils) and when hot temperatures increase evaporation of smaller spray droplets before they hit target. Risk is generally low right now for European corn borer and corn rootworms, but risk is not gone. You can either choose to ignore that risk (and accept the potential yield loss in your fields) or minimize that risk through active management (scouting + insecticides). Hutchison, W.D., E.C. Burkness, P.D. Mitchell, R.D. Moon, T.W. Leslie, S. J. Fleischer, M. Abrahamson, K.L. Hamilton, K.L. Steffey, M.E. Gray, R.L. Hellmich, L.V. Kaster, T.E. Hunt, R.J. Wright, K. Pecinovsky, T.L. Rabaey, B.R. Flood, E.S. Raun. 2010. Areawide suppression of European corn borer with Bt maize reaps savings to non –Bt maize growers. Science. 330:222-5. doi: 10.1126/science.1190242. Pilcher CD, Rice ME, Higgins RA, Steffey KL, Hellmich RL, Witkowski J, Calvin D, Ostlie KR, Gray M. 2002. 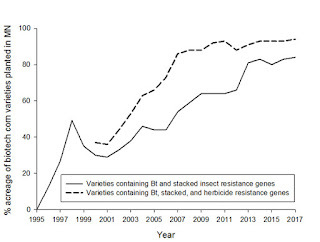 Biotechnology and the European corn borer: measuring historical farmer perceptions and adoption of transgenic Bt corn as a pest management strategy. J Econ Entomol. 95(5):878-92. We would also like to thank those who helped with the fall survey: Eric Burkness, Dr. Phil Glogoza, Dr. Angie Peltier, Dr. Michael Goblirsch, and Travis Vollmer.